Come winter I’m all about neutral sweaters! Forever searching for the person one. Well it has finally happened, I have finally found the perfect everyday neutral sweater to dress up and down! Happy Friday eve y’all! This week has honestly flown by. I cannot believe tomorrow is already Friday but I am oh so ready for the weekend and for some sunshine. Which the weatherman has said will be arriving tomorrow! We have a pretty calm weekend planned. Nothing tomorrow night aka movie night or catching up on This Is Us (finally). Saturday some birthday celebrations for friends and Sunday church + a walk with one of my girl friends. This kind of weekend, is my kind of weekend! What all do y’all have planned? Going anywhere or staying put? If you see me this weekend, chances are I’ll be wearing this ivory turtleneck sweater. 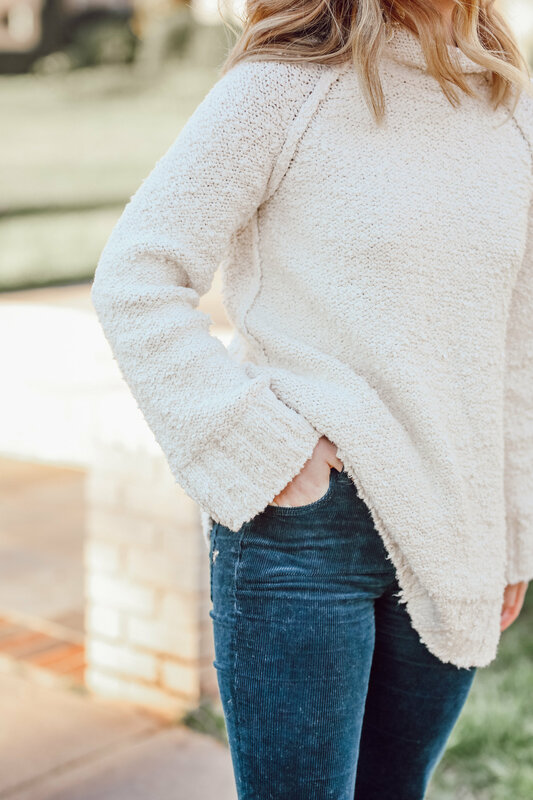 It is the most perfect neutral everyday sweater. Seriously, I have worn it almost everyday that I’ve actually made it into real clothes (not pajamas, workout wear, or athleisure clothing). 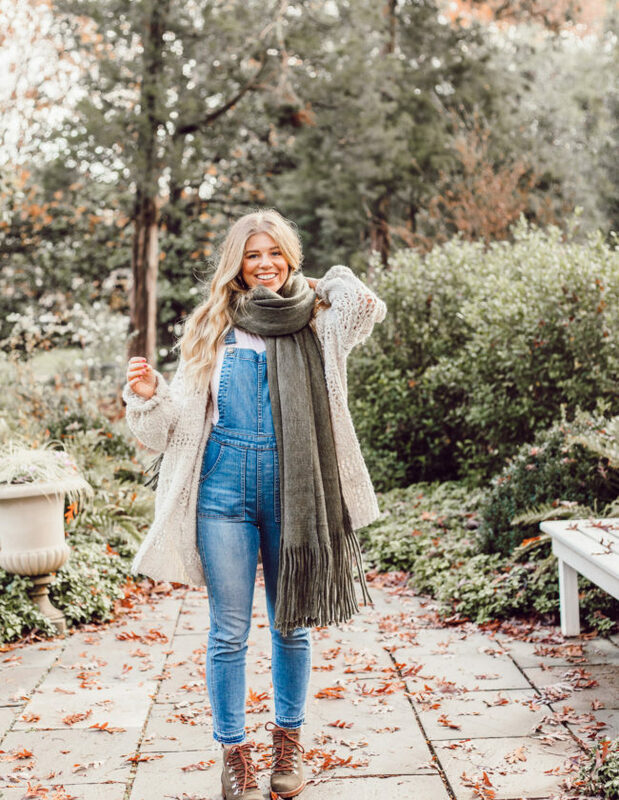 It is the perfect weight, slightly oversized, and oh so cozy! Plus, it looks great paired with so many different items (see it styled with denim and worn under a teddy vest). 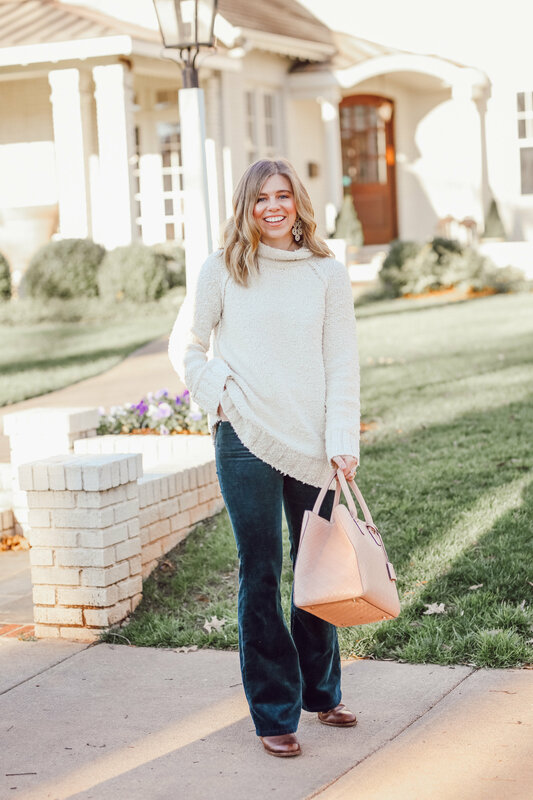 Truly a versatile sweater you can wear every day with every thing! 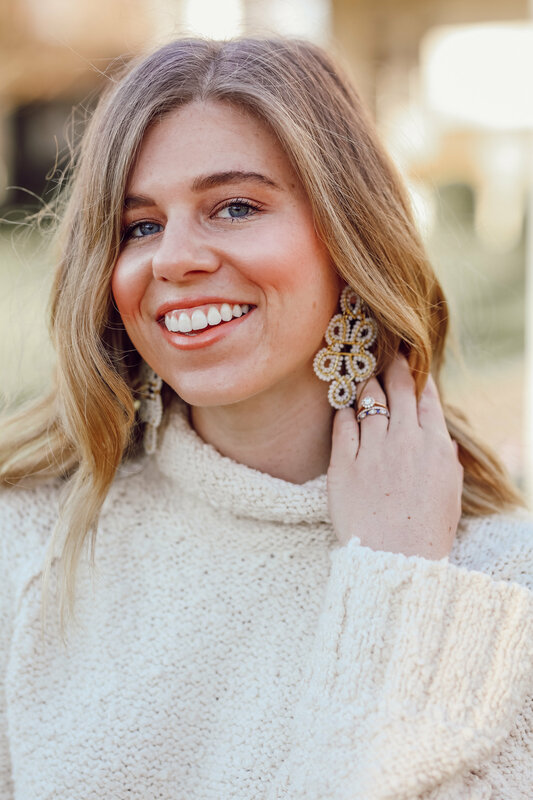 If neutral (or ivory) happens to not be your thing or your looking to add some colorful sweaters to your wardrobe, this beauty also comes in mint and margo (a bright yellowy-orange). Not quite as versatile but definitely could still be paired with a lot. Including the cords in I’m wearing as well as your favorite denim. So which color would you choose? Neutral ivory or going bright with one of the over two? It really is! You totally need to add it to your collection! It’s cold in Florida today and I’d love to be cozy in that sweater. So cute on you! Aw! It would be perfect for that. It is one of those you could totally wear with shorts when it’s a bit warmer too. Wow I loveeee this ivory sweater so much! A great transitional piece from winter to spring, too. 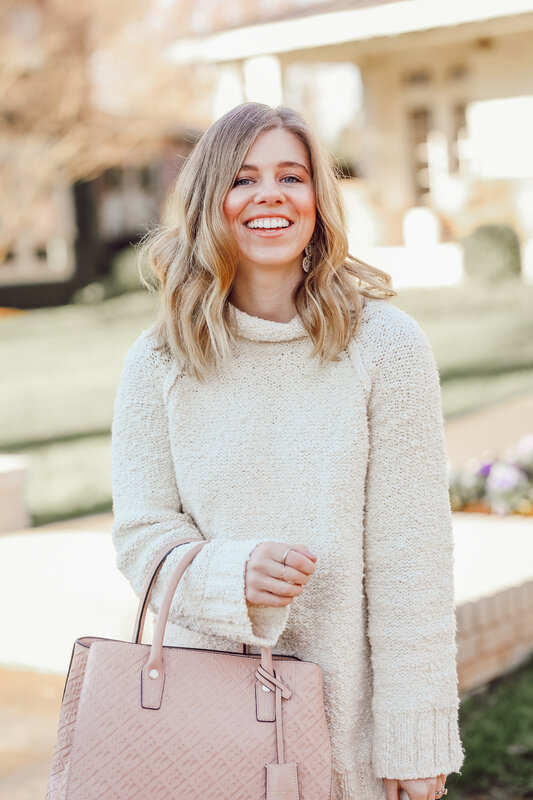 I also love that blush tote you have! That sweater looks so cozy! Actually this whole outfit looks amazing! 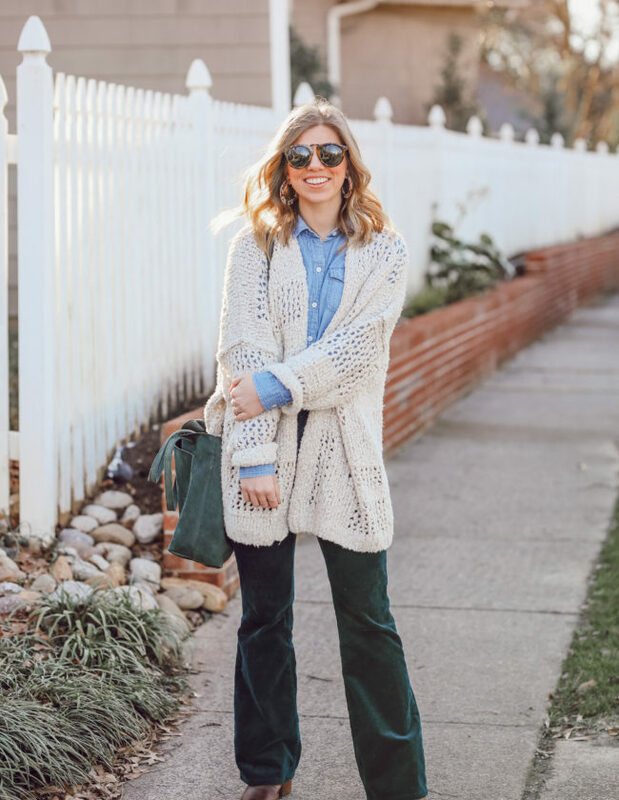 Love those velvet pants! It really is! Aw thank you gal 🙂 so sweet of you! 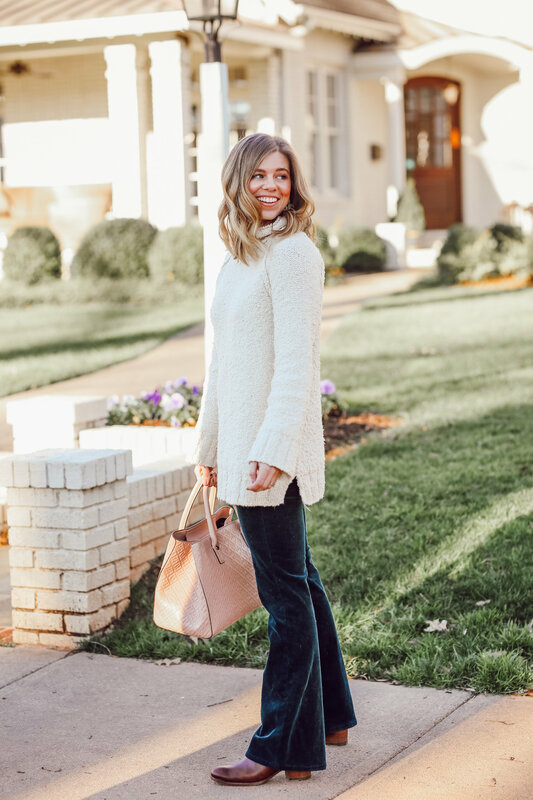 love the flared jeans with the sweater! super darling look! I know you’re excited for a relaxing weekend but you have been go-go-go lately! You deserve it! Oh – and I’m stealing this sweater 🙂 K thanks bye! Yes, for sure! This gal needs some down time haha. Thanks girl friend 🙂 I’ll be sure to keep it hidden when you come over haha. Cute sweater! I am also loving your fabulous handbag!! Thanks girl friend! It’s been a favorite of mine for over a year now – just love carrying it. Goes with so much and is the perfect size for carrying everything you need. This is the cutestttt sweater & it looks so cozy! I know I would be wearing it 24/7! You’re the queen of neutrals! In love with this cozy sweater. Oh my goodness, thank you! That is such a sweet compliment! I am loving that sweater! It looks so cozy and it looks great with the flare pants too. Thanks girl friend! It really is the coziest – so soft! I love the whole look! This sweater look soooo cozy! Thanks Katelyn! It really is super cozy! I absolutely love this chunky, oversized sweater. It looks so dang cozy. 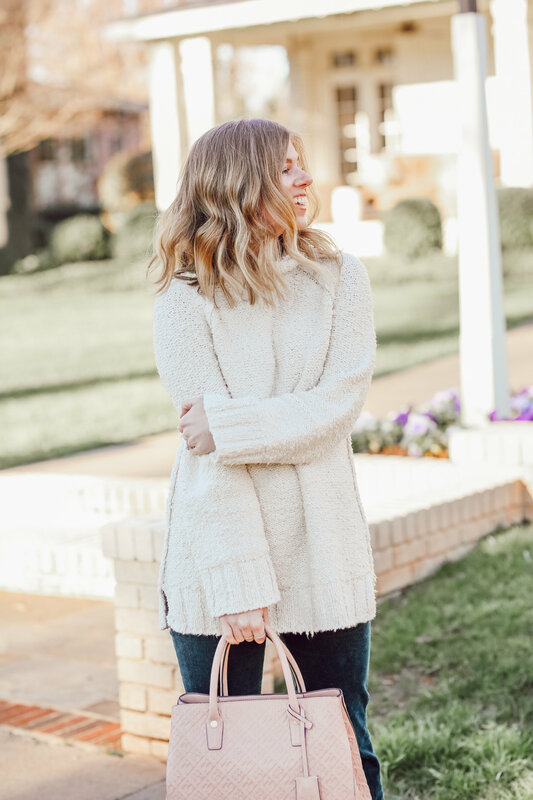 A comfy cream sweater is always a good idea in my book! Thanks girl friend! And yes, I completely agree with you on that! That sweater looks so cozy and I think you styled it perfectly! Ohhh yes! Neutral sweaters are my favorite. Love how you styled this one! They’re just the best, aren’t they? Love them!